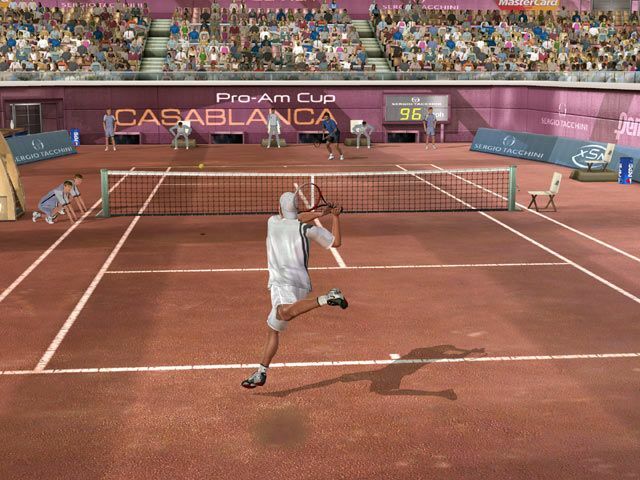 There's just something about Tennis that makes it a great sport for video games. The best recreations of it can see two evenly matched players slogging it out for hours, working hard for every opening to take the upper hand in a rally. Given that the sport itself seems like a simple case of a ball being hit back and forth, the fact that most tennis sims get it wrong must suggest that is isn't that simple at all. The fact that PAM managed to muscle in on the genre dominated by Virtua Tennis shows that the Top Spin series has got something about it, and Top Spin 2 really won't disappoint fans of the original game. To be fair, anyone who's spent considerable time with Top Spin will quickly see that the sequel is more of an evolution than a revolution, with first-impressions being that Top Spin 2 is simply Top Spin in new clothes. Further play will highlight a number of subtle changes, though, and they're enough to make the game superior to its older brother - just not by all that much. Top Spin differentiated itself from other tennis games on the market by introducing risk shots, and this has been further developed in Top Spin 2. You've still got your basic shot, which will never be struck wide of the court, plus top spin, slice and lob shots. To introduce an element of difficulty to these advanced strokes, your shots will land out if you hold a direction for too long, especially if your player is lacking skills in that area. A momentum meter, which is increased by playing winning shots, can be used to play variations on each basic shot type if holding the left trigger, and full-on risk shots can be attempted in combination with the right trigger. Right trigger risk shots are just as tricky as they've ever been, with their use only really advised if you're in a real tight spot and need a miracle. The risk serve is about the only shot you can use with any regularity as it's the easiest to pull off and you have a second serve to fall back on should it go horribly wrong. Mastering all the strokes is vital if you're going to become the No.1 ranked player, but if you just want a game to play with some friends, using the plain shots will still be enough to have a good time. All the expected exhibition, tournament and party games are included, each playable with any of the game's 24 real-life pros. You've got the likes of Roger Federer, Andy Roddick, Venus Williams and Maria Sharapova to choose from, or you can use your custom player from the career mode. It's the career mode that really makes Top Spin 2 a hard game to stop playing. It's not without its faults, but trying to improve your player, move up the rankings and become a tennis superstar is extremely addictive. Once you've created your player using the comprehensive creation tool it's time to start your career. This is all handled via a simple diary that lists up to three possible activities available on each day, with your dilemma being which activity you choose to do during that day. At first it's pretty simple, as you're going to need to do some basic training, but soon you'll be out of money (or coin as the game calls it) and you'll need to enter some small-time events to raise some cash for further training. More coaches offer their services along the way and the cost of training increases along with your skills in each area, so once you're into your second season you'll have to pick and choose events very carefully. Only a small number of the big name pros are included, but they're some of the biggestIf you like you can buy new equipment, get a new sponsor, do some personal grooming, read messages from rivals, get your own fan club and even represent your country in international events. The real thrill comes from competing in Grand Slams, where you'll come across the big licensed players in the game and face a real challenge. Big events feature proper five set matches for men (three for women), although the games needed to win a set is still reduced to three. Even so, five set matches can last for considerable lengths of time, and victories feel well earned. If you don't fancy playing every game yourself you can even let the system work out results for you, jumping in to take over if you feel you're player isn't doing as well as he/she could be. Single system play for up to four players is obviously included, as is online play for the same number, with up to two players able to play on a single 360. Some people might dislike the fact that you can only play ranked matches with your custom player, but exhibition matches can be played with any of the players in the game. You're limited to the basic game modes, but the ranking system should prove popular for anyone who has spent a long time building up their custom character. Lag was noticeable in a number of games, which can be annoying in ranked matches, but if you get together with someone who has a good internet connection you shouldn't have too many problems. 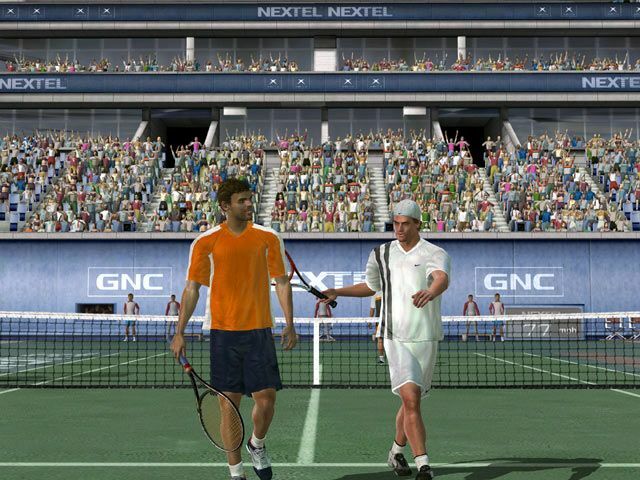 Being the first next-gen tennis game there were some high expectations on Top Spin 2 to look stunning, and while character models and environments are a step above those seen in the Xbox original, they don't quite have that next-gen feel. It plays like tennis and looks like tennis, but it just doesn't feel alive, particularly in Grand Slams. The stadiums are half empty and the crowd noise feels incredibly artificial, akin to a poorly used laughter track during a TV show - the atmosphere is almost non-existent. Things aren't helped by players glitching through officials and ball boys ignoring the balls they run across the court to collect, making it feel like the game needed a few more months in development to get all these small details right. It looks nice enough, but it's not a huge leap over the originalIt seems as if the soundtrack was also an afterthought or perhaps not even a thought at all, as all you ever hear is the same few tracks over and over again. Considering every game released nowadays seems to include a licensed soundtrack of some sort, this seems odd and pretty lazy. You can of course use your own music, but considering 2K Sports' Amped 3 featured a huge soundtrack, an absence of one here is baffling. Even with a number of sloppy audio problems and an overall game that feels strikingly similar to Top Spin on the Xbox, it's still hugely addictive. The changes to the shot system are subtle, but enough to mean you'll continue to improve as you play, and the career mode is able to zap huge amounts of time. A more comprehensive online mode would have been great, but it's serviceable, and the visuals are just good enough to land in the next-gen category. Top Spin 2 certainly isn't a game to buy an Xbox 360 for, but it is the only tennis game on the system and it'll probably remain the best for quite some time.